Oh dear God, this looks amazing. *swoon* I really hope they record this; I wanna watch it! ^this this this this this this this this!!!!!!!!!!!!!!!!!!!!!!!!!!!!!!!!!!!!!!!!!!!!!!!!!!!!! I think that a character named 'Lemures Leader' was mentioned earlier in some musical information which would make sense since according to the katakana 'remuresu', the grey haired character in the newest photos could be that Lemures leader. And I need to agree with Verdi and Mars about the cast. Oooh! I am SOOO loving the Generals and Queen Serenity. So exciting!! The new cast is so adorable. So if I am reading the google translate right, it is saying something about MCZ doing Moonlight Densetsu for the musical? But I can't understand if they mean its the theme or if they are just doing a performance of it. Loving the cast in general. The girl playing Sailor Venus looks perfect, imo. As for it being an all-female cast, I think it's pretty cool. With Takeuchi herself being a fan of Takarazuka Revue, I figured this is perfect. I will miss some of the male performers from the original musicals (coughMochizukiYuutacough), but I rather like this direction. I hope it's recorded and/or put on video for those of us who can't see it in Japan to enjoy. btw I really can't stop staring at Jadeite (Root). Finally!! A Venus I'm going to actually like! So, have you guys seen the Animelo event? What do you think? I think the actresses fit their characters pretty well. Especially Venus and Mars! I hope the musical is up to the level of the cast. Based on the songs they performed, I'm afraid it won't be. They were generic, plain, and forgettable. I really like the horn sounds, but the rest of the music blows. ("We Are the Pretty Guardians" is no "Sailor War".) It's not up to the level of the previous musicals. The choreography was boring and plain too. This was supposed to get people excited to see the show, a selection of the best songs that summarize what the show is like. The actresses were very likeable, but if these are the best songs they have to offer, then it makes me nervous. This is looking like an elementary school talent show, not a "seramyu". Anyway, those are just opnions. There are techincal problems though. Particularly Sailor Moon's wig, which I knew was going to be a disaster..... Everything I thought would happen did. There's a reason they never did her pigtails like this in the previous musicals. The hair will be getting caught around her microphone and wrapped around things, and will hinder her movement. That poor girl is being so careful to keep her wig from getting tangled. She shouldn't have to do that. That's caused by bad design. They need to revise the pigtails to be more like the previous shows. You can't have continous three-foot long synthetic hair when you're dancing. I'm kind of stupefied that any costume designer would make that mistake. Or maybe the costume designer will get it and revise the costumes before the show. Since it's only in a few weeks they probably won't. There are some little tweaks though, like Sailor Mars's back bow is red now instead of purple. The costumes look a bit like they were designed by someone who didn't quite know what they were doing. (For example, the Shitennou have black pants. If the sets are mostly black like they used to be, they will be floating torsos with no legs onstage. And how about Tuxedo Mask's almost entirely-black costume? There's a reason they made his cape gold in the previous shows.) And somethin's goin' on with the skirts. Their underskirs aren't all the same lengths.... Is Sailor Mars "sagging" like a hip-hop guy or what? I think something's not attached to something or something. Sorry guys, I'm very opnionated about costumes... I've done theatrical costume design, and I was always really impressed with the choices the original designer(s) made on the soldier's costumes in the previous shows. (There was actually a reason they had all that mylar trim on them. lol) They were very well-thought-out both from a design standpoint and technical standpoint. These costumes look pretty, but aren't thought out as well. Also, I'm sorry, but I'm not too thrilled by the fact that the Sailor Moon actress can't sing very well. This is a musical. There's no excuse for that. The other acresses were okay, but the lead actress in a musical needs to be able to sing, even if it's just "Sailor Moon". She sings like a good Usagi acting-wise though. One other thing. I think it was a mistake to give the characters new poses. I was really hoping they would keep the old ones. If they want this show to be in the same "image" as the originals, they need to keep some of the "little" things from the originals for the old-timers to get excited by. I was hoping for more of a "here's some new stuff, here's some old stuff" thing. And in regards to that - if they don't sing La Soldier, I hope people from the audience bum rush the stage and rip out their weaves. (I'm talking about the composer and lyricist, not the actresses.) That would be totally unacceptable. Sorry for all the negativity! But, come on, guys, I want to hear about the stuff you DON'T like!! :bunnyhappy:I'm still excited to see this musical because it will be nice to see the original story done again in this way. It's intriguing to see how Queen Serenity will be involved (maybe taking the place of Luna and Artemis?). I'm sure since Takeuchi Naoko is directly involved this time around the story at least will be good! And I hope it does well enough that they can officially re-start the musical franchise, because it was always my favorite version of Sailor Moon. BTW It's so crazy that we can see these things so quickly now. In 1997 you just heard guarded whispers about Sailor Moon musicals, but there was almost NO info about them at all in English. Now we know about them immediately and even get to see videos... We are so spoiled nowadays! Not to defend them or anything, but I think they are playing it safe. "We are the Pretty Guardians" and the other song sound too much more like anime theme songs that fit for modern Japanese music. I think they don't want to take too many risks (like the original myus often did) because well, that Sailor Moon event at Animelo wasn't REALLY that huge. It was on a side stage as a side performance while the main events were going on (MCZ being the 2nd act btw). Some of you might not realize, but Animelo is a big event and lasts a few days. So that Sailor Moon importance really wasn't that BIG. Which I think shows how popular it is right now, which is probably why they are playing it "safe" with the music and bringing in popular Takarazuka actresses (that is obviously also a Naoko influence too). Also part of th reason the music is lacking, i think is due to the lack of Akiko Kosaka. She really knew how to compose music to fit the feel of a scene or whatever emotion she was trying to get across and the music was more showtunesy and more wide-genre influenced. I hope we have more of that. Its hard to judge with only two anthem type songs though. I know some people were saying they weren't practiced for it but...the musicals performance starts in less than a month, they should be practicing nearly everyday at this point. I think the Sailor Moon actress isn't too terrible. She sounded better in the 2nd song and her voice isn't the worst, but definitely nothing like the previous Moons. Like I said, she kinda sounds like early Marina. So maybe we'll see some improvement like we did with Marina? Photos of the actual musical performance were released on Comic Natalie's website! Check out all photos by clicking this link. Well it looks cute in the photos! here's to hoping the performance is good too. Any japanese reviews yet? There's a gallery of more images HERE (on my phone so it's hard for me to put the actual photos in this thread). They also added a disclaimer saying they're not a great translator and it might be better to wait for official sources. I found this and thought it was really amusing. I translated the drinks' ingredients. I have not seen any personal reviews of the musical but hopefully we will get some soon. 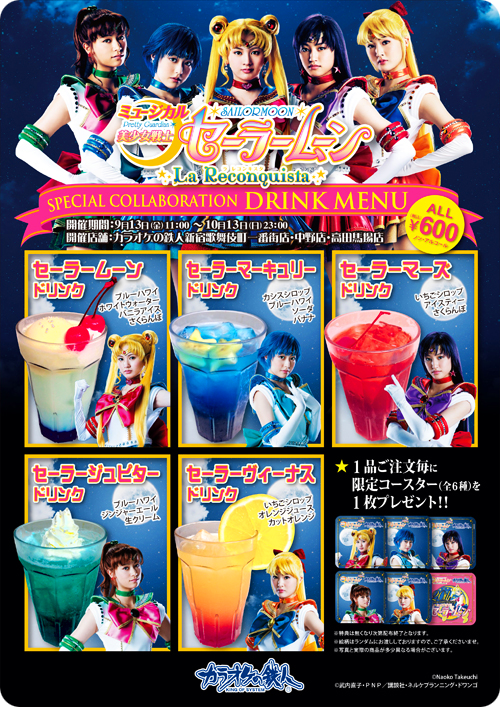 Also, like the tumblr post Rei posted here said, Moonlight Densetsu was mentioned to have made a comeback. Oh awesome. I wanted to make these drinks so bad and now I can! I'll see if I can figure out what "white water" would be. Someone mentioned that they didn't sing La Soldier, after all ... ;-; I don't know how reliable that was, but it still makes me sad. But, the screens look so good <3 I am still excited for this Myu. I just hope they do include La Soldier since it's such an iconic Myu song. If you figure it out I'd love to know. I didn't have too much of a hard time with the other ingredients, but the "white water" just doesn't ring any bells for me. I did a little more research, and apparently it's specific brand of non-carbonated milk soft drink, sort of like Calpis/Calpico. 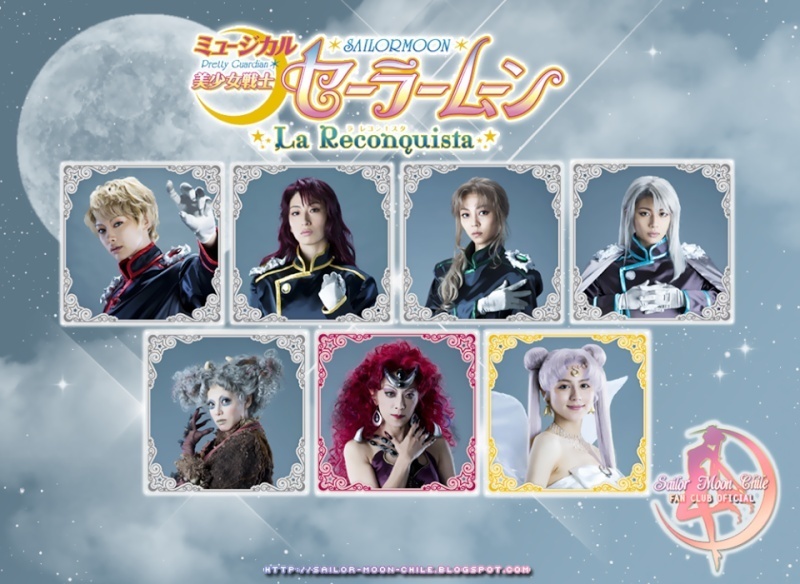 Great news to all Sera Myu fans: I read that an official DVD release of La Reconquista was confirmed at the musical! Which means that we will have the chance to see it recorded even if we cannot see it live . As for now, there is no release date announced, yet. I don't care that we don't have a release date yet but I get to see it *tackle hugs Tsuki* that really made my day! I smell a future stream. Haha sorry Tsuki if I just repeated what you said..! !